The Chicago Police Department has online services that allow citizens to submit information to the police. Join your neighbors who have homes and families on any given block in the city and have organized to improve the quality of life in their neighborhoods. 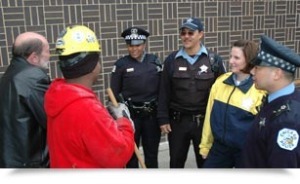 Chicago's major urban area fusion center collaboration between federal, state, county and local law enforcement and public safety agencies. Partner with the City of Chicago and the Chicago Police Department to host a gun buy-back event. The Chicago Police Department urges you to register your bike with us. Registration can help us recover your bike if it is lost or stolen. Online Crime Reporting You can use the system to make an immediate report of a crime in which you are the victim. Report activities or behaviors that are suspicious and/or criminal and are possible related to terrorism. Contact the Chicago Police Department if you have a community concern that you feel needs our attention. Call 311 to report a needed City service. Quickly addressing the physical conditions that can contribute to crime is a powerful deterrent and can help make your block safer and cleaner. TipSubmit allows the public to submit suspicious activity or crime tips with media attachments to the Chicago Police Department using a web or mobile browser. TXT2TIP allows the public to text tips (including pictures, video or audio) about criminal activity to the Chicago Police Department from any mobile phone.